"Low-carb, healthful snack choice which can be kept in the fridge for up to two weeks." Preheat oven to 375 degrees F (190 degrees C). Stir the olives together with the wine, orange juice, olive oil, and garlic in a 9x13 inch baking dish. Nestle the sprigs of rosemary in the olives. Bake in the preheated oven for 15 minutes, stirring halfway through the baking. Remove and discard the rosemary sprigs, then stir in the parsley, oregano, orange zest, and red pepper flakes. 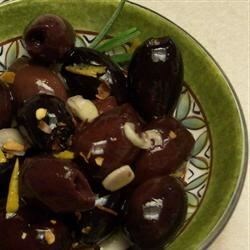 Serve warm, or cool the olives and use them to top a salad. A saucy, cheesy and tempting pasta bake! They are ok, I don't think I liked the mixture of olives and orange juice. They would have been better without the juice for me. Thank you for sharing! Loved these olives and it took no time to make. The green cerignolas olives were especially good. Thanks for sharing MIZDIZ. These nibbles are fantastic! Made them (along with several other munchies) for a weekend cocktail party and these were the first to go! Try them, you won't be disappointed! These are so yummy! I used a varity of olives and they all tasted wonderful. Followed the recipe as is. Soo Good! I used one can each green, black, and kalamata olives with a semi-sweet wine and only 1 T olive oil. They get even better after sitting a few days.